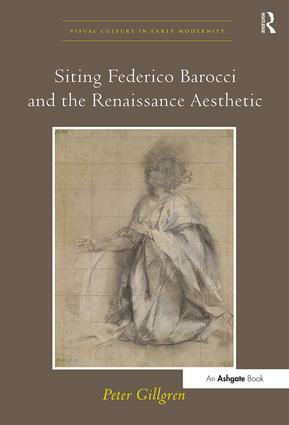 Focusing on what he calls 'the performative gaze', the author explores the artistic world of the Urbino painter Federico Barocci (1535-1612) in the context of Renaissance culture. Through analysis of Barocci's works, Gillgren also sheds new light on Renaissance aesthetic communication generally. The first part of the book discusses the poetics of Early Modern painting, based on contemporary theories of Reception Aesthetics, hermeneutics and phenomenology, but grounded in Renaissance culture itself through numerous examples from Early Modern painting. The author discusses works by such artists as Botticelli, Raphael, Titian, VelÃ¡zquez and Poussin from the point of view of their spectator status. The second part deals specifically with the art of Federico Barocci, showing in detail how his works relate to aspects of the gaze and to their intended spectators. Gillgren's method is unusual in that he takes care to set the images within their original physical contexts (lighting, space, framing materials, angle of viewer approach) as much as possible through careful analysis of early descriptions of now destroyed or modified chapels. The third section of the volume contains a brief catalogue of Barocci's paintings, presented in a chronological order, with a full bibliography and with details about the painting's original locations. Contents: Preface; Introduction: hermeneutical premises; The performative gaze; Aesthetic communication; The Barocci discourse; Part I Towards a Poetics of the Gaze: The pleasure of mimesis; The importance of the site; Positioning the spectator's gaze; Interior communication and relationships; The implicit spectator; Vacancies and fragments; Intersubjectivity. Part II The Art of Federico Barocci: Early works; The casino of Pius IV; Drama and allegory; Lyric and dialogue; Mixed genre works; The Visitation; Fragments of classicism; An oblique crucifixion; The eucharist in Urbino and in Rome; Meditations; Last works. Part III Catalogue of Paintings by Federico Barocci. Bibliography; Index. Peter Gillgren is Anders Zorn Professor of Art History at Stockholm University, Sweden.